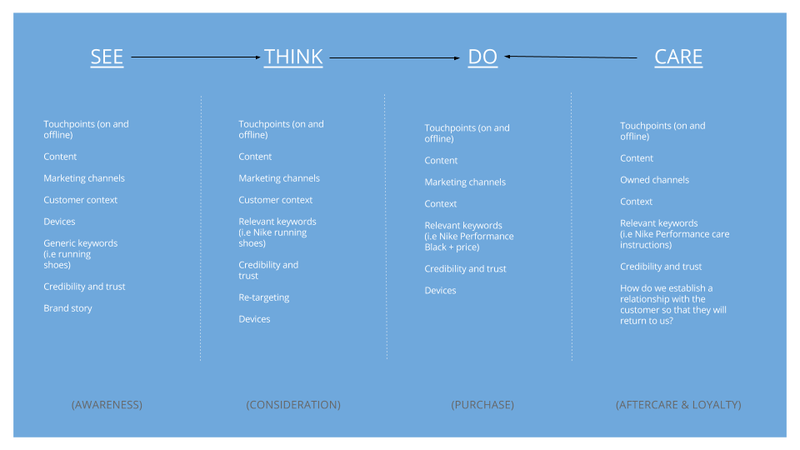 A user journey/path to purchase is useful to help you develop communication, content and marketing strategies that are from your customers or potential customers point of view (i.e need based). I like to simplify, so I have abandoned the classic AIDA model (attention, intention, desire and action) which was used in school way, way back then for: See, think, do and care – which from my perspective is more straightforward and easy to use in the work I do with my clients and more applicable in our current context (remember the AIDA model originated around 1898). See – this is where your company are noticed, so perhaps it’s through ads, on and offline. Perhaps with articles relating to running in this case. Think – is where a person is thinking about a solution, let’s say that we focus on a person looking for a pair of new running shoes. However, they are open to any brand and model but found this particular online store and are now browsing the selection available. They are starting to consider some options. Do – this is where the person has decided that they want to buy a pair of new running shoes, from a particular brand, to colour and model and is ready to make the purchase. Care/loyalty – is after a person has bought the running shoes, how can you care for them in a way so that next time they need a pair of new running shoes they come back to the same online store. Perhaps with advice on how to best wash and care for the shoes for better durability? perhaps the person signed up for a newsletter, where you based on the purchase target this person with other items and inspiration related to running? Or another possibility is that the sports store in question attracts someone else customer into this type of content and therefore may attract additional customers from this in the future. You want to move your customers through each phase of this model. And of course it’s not always as straightforward for a customer to buy from you online. The main point of this is to have a more customer centric approach for content, marketing and activities. What obstacles do we have to move the customer into the next phase? How can we make our products relevant? How do we prove our credibility and earn their trust? Want to use the simple sketch I have made above? feel free. Download the ppt file right here. Of course – you want to be able to evaluate, optimize and measure success – so define the KPI’s – use this article and template to follow and evaluate your performance.